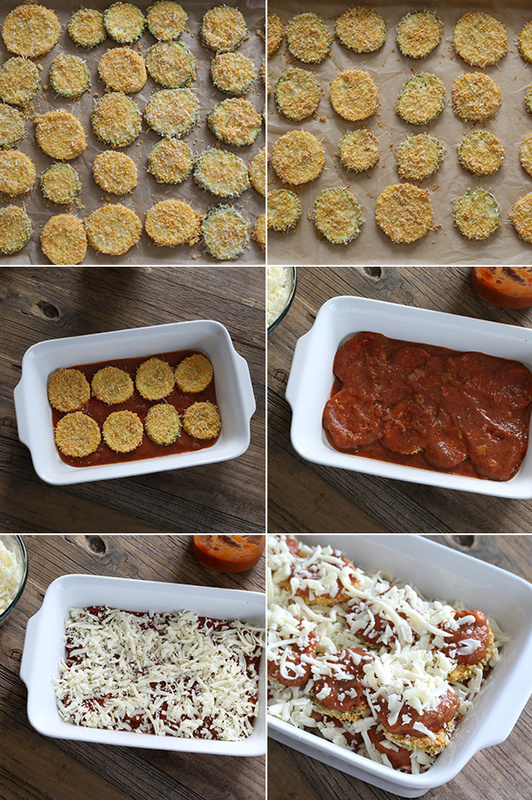 Gluten Free Zucchini Parmesan | Great gluten free recipes for every occasion. Just enjoy them with some tomato sauce for dipping, just as they are baked. It’s easy! And unlike some zucchini recipes, you use up a ton of your zucchini crop. You can see (and could have guessed) how easy it is to make zucchini-parm. But what you might not be able to tell from the step by step photos above? In the summertime, my favorite recipe for simple tomato sauce is better than ever because of a secret ingredient: shredded fresh zucchini! To my basic recipe, I add two simple things: a small can of tomato paste, and 2 medium fresh zucchini, pureed. It gives a surprising depth of flavor to the sauce, and, of all things, makes it creamy. Creamy! Amazing. Preheat your oven to 425°F. Line large rimmed baking sheets with unbleached parchment paper and set them aside. Slice the zucchini (or yellow squash) into 1/4-inch thick rounds and place them in a large bowl. If you have a mandolin slicer, set it to the largest slicing setting. Add the flour to the bowl of zucchini slices and toss to coat completely, prying open any slices that have stuck together. Place the eggs, beaten with milk, in another large, flat bowl. Place the breadcrumbs, Parmigiano-Reggiano cheese, garlic powder and salt in a large, flat bowl, beside the egg mixture. Place the lined baking sheets next to the breadcrumb mixture. 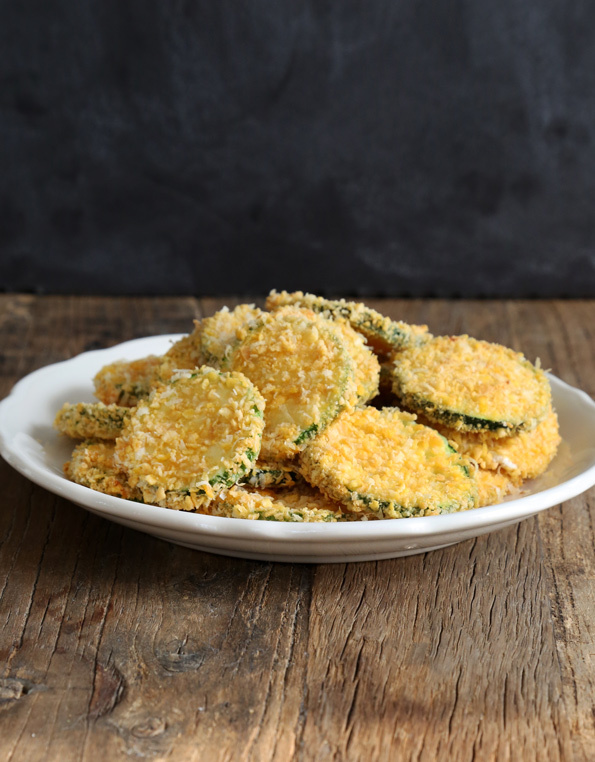 Dip each slice of zucchini in the egg mixture, allow all of the excess egg to drip back into the bowl, and the press both sides into the breadcrumb mixture. Place each slice on the prepared baking sheets, side by side. Place in the center of the preheated oven and bake until soft to the touch & golden brown, about 15 minutes. The zucchini slices can be enjoyed just like this, with some tomato sauce for dipping. To make a more traditional eggplant-parm-type dish, reduce your oven temperature to 350°F. 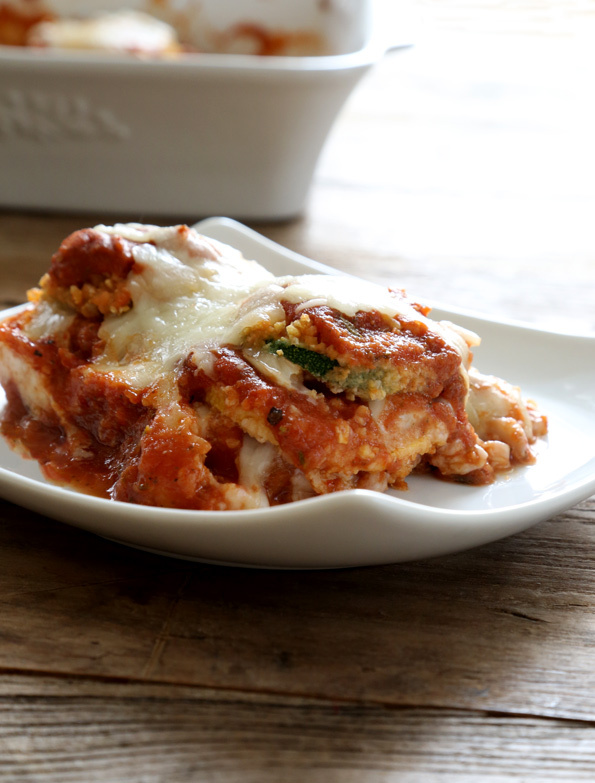 Cover the bottom of a 9-inch x 12-inch baking dish with about 1/2 cup tomato sauce, then place baked zucchini slices on top of the sauce in a single layer, cover each slice with sauce, and top with shredded cheese. Repeat the zucchini slice, tomato sauce then cheese, layering the slices on top of one another, until you reach the top of your dish, finishing with a layer of shredded cheese. Place in the center of the preheated oven and bake for about 10 minutes, or until the cheese is melted and the sauce is bubbling. P.S. Which Gluten-Free on a Shoestring cookbooks do you have? Pick them up today! Your support keeps the blog going and the books coming! 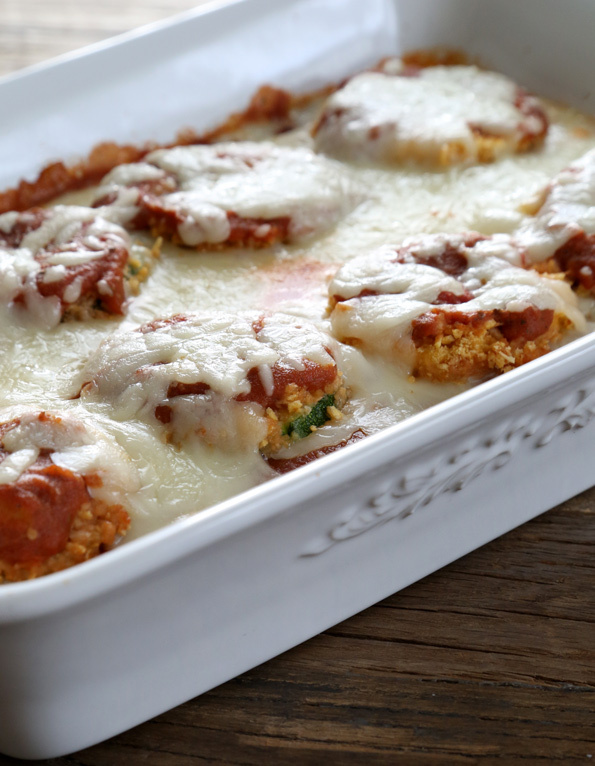 Made these for dinner tonight – delicious – we tried them after baking them and then we made parm with them. Great recipe, thanks. We also made baked ziti and chicken parm…Italian extravaganza!! hehehe..made this tonight. I love it when the gluten eaters ask for seconds…and thirds :). Thank you Nicole for all you do! I tried to make zuchinni and eggplant sliced in 1/4 inch thick slices and spritzed olive oil on them, Italian seasons, and garlic powder on them and baked at 350 for 10 min. on each side. The first batch was real good but I burnt the second tray because I started putting clothes away instead of listening for the timer. We scraped off the burnt part and dipped in salsa, and they were ok, but not as good as the first tray. The 5 or 7 slices of leftovers, I put in my veg. soup and they definitely added a different flavor. My mom uses zuchinni w/ eggs like an omelet or my hubby’s mom used them w/ ham and green beans. Zuchini is how we are sure its summer. Thanks for your ideas, they are awesome. Oh, this looks amazing! I can’t wait to try this! You can also shred the zucchini, mix with beaten egg, 1/2 c g.f. flour, a little salt, pepper and garlic powder, and make patties to fry (or bake, I guess. Like Mare, I am old school about frying the zucchini.) You can just serve these patties as a side dish, potato pancake style with sour cream, etc, or make the zucchini parm out of the fried patties. You all will love it this way as well. off topic, but I just got GFOAS Bakes Bread as a birthday present and I’m so excited to start, er, baking bread! Yum!! This looks so good! I don’t have zucchini growing in my backyard, but I plan on hitting the Farmers Market this week and will get some just so I can make this. Love zucchini and this looks delicious! Sounds like a plan, Kathleen! Now, this is one recipe I do not need. I have been making zucchini parm for years, so converting it to gluten free was not at all hard for me. And yes, zucchini (even carrots) in the sauce adds so much flavor! In fact we had some awesome zucchini parm last week because I went to the farmers market and got some amazing larger zucchinis. The farmer told me people want the larger ones now to make the zoodles instead of spaghetti. I am lucky I got enough to make a pan. I’ve also combined eggplant and zucchini to make my parm. Oh another one is a layer of zucchini parm, a layer of baked ziti fixings, then another layer of zucchini parm (eggplant can be substituted for the zucchini) to make an awesome zucchini parm/baked ziti casserole. Oh…I wonder how my baked casserole would be with your cheese tortellini recipe. I love adding carrots to spaghetti sauce. A friend taught me that several years ago. It adds a subtle sweetness. I am looking forward to trying it with the zucchini as well. If you’re looking for a real trick, Elizabeth, definitely go for the zucchini-in-tomato-sauce deal! where are all you zucchini growing people in my life??? I WANT SOME!!! Have you ever tried making zoodles (zucchini noodles) with a spiralizer? the next time I get my hands on some of the good stuff, I’m going to make some and see how I like ’em. They’d go great with your pasta sauce recipe, I bet!!! Oh, no, Jennifer, seriously if you lived close to me I’d pile so much zucchini in your arms that you’d fall over from the very weight of it! I have a spiralizer and have noodled lots of things but I have to say that that thing is a virtual death trap for me. So sharp! So hard to clean without mauling my own fingers! I love zucchini parmesan! Eggplant can sometimes be bitter and seedy. I’ll be over for dinner tonight. Did you use a panko style breadcrumb here? I have found that I love zucchini (that aren’t overgrown) and summer squash raw. I make tuna salad and serve it on slices of them instead of on crackers. Very tasty! Donia, trick to eggplant is to slice, salt and layer on paper towels. It takes out moisture and bitterness. I hear you about eggplant sometimes, Donia (well, my kids certainly hear you), but I find that when you bake it in slices, like we’re doing with zucchini in this recipe, it isn’t bitter at all. If you’re going to fry eggplant, then it definitely pays to sweat it, as Mare describes below.